Chase a Paper Rainbow: Happy Birthday Master 5! 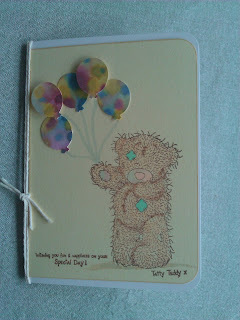 Topper - cream watercolour paper, stamped in Versafine Vintage Sepia ink with a Tatty Teddy bear (free stamp from Docrafts magazine). Bear was coloured and grounded with Copic markers. Balloon paper was made by dropping Ranger Distress Reinkers onto cardstock, then misting with Perfect Pearls mist (PP in water), then punched with balloon punch. Three balloons mounted with double-sided tape, two balloons mounted with foam tape. Sentiment from free set also.